Dr. Pope: Half the evil in the world is caused by confusing the written word with reality. Catherine Fengriffen: Or legend with fact? When it came to English horror in the early 1960s on through the mid 1970s, it seemed that Amicus Studios operated just in the shadows of the more well known Hammer Studios. Never with quite the same Q-rating, Amicus�a British operation run by two Americans (Milton Subotsky and Max J. Rosenberg)�churned out a healthy library of low-budget horror titles, and really hit its stride as Hammer's staying power finally began to wane in the early 1970s. Dark Sky has begun to reissue some of the more interesting works as part of their new Amicus Collection, with remastered anamorphic transfers, commentaries, etc. And Now The Screaming Starts! (you have to have that exclamation point) was a 1972 released directed by Roy Ward Baker (A Night To Remember, Dr. Jekyll and Sister Hyde, Quatermass and the Pit) in which the notably non-horrific novella Fengriffen by David Case was trussed up into a significantly more bloody spookfest, complete with a severed hand with a mind of its own. 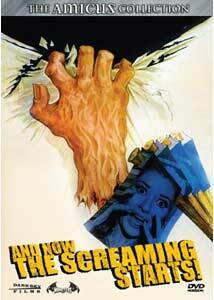 While Fengriffen had some ghostly elements, Amicus heads Subotsky and Rosenberg turned things to 11, much to the chagrin of former Hammer man Baker, who had to endure the lurid title and the sometimes awkwardly forced horror elements that ended up giving this film the distinct feel of two separate stories that never quite seemed to fit together. It is 1795 England, and as the film opens the lovely Catherine (Stephanie Beacham) arrives at the foreboding manor where she is to marry Sir Charles Fengriffen (Witchfinder General's Ian Ogilvy). Almost immediately upon arrival, Catherine is set upon by a series of strange hallucinations and visions involving the aforementioned severed hand, as well as a creepy, eyeless ghost. Catherine's sanity, to say nothing of her life, is threatened as she tries to uncover the source of the supernatural happenings, and her sudden pregnancy only adds to the mystery as she slowly begins to find out what dark secrets really exist at Fengriffen. Dr. Pope (Peter Cushing), an outside-the-box-thinking psychiatrist, is called in to investigate the claims of ghosts, and struggling in vain to find a way to cure, with reason, what he perceives as Catherine's delusions. For me it's tough to knock any English horror film that has Peter Cushing (even if he doesn't show up until nearly 47 minutes in, as he does here), because for my money he has the kind of singular presence that saves even the most questionable project. Even with the perpetually heaving bosom of Stephanie Beacham, it is Cushing's arrival and subsequent presence that moves And Now The Screaming Starts! to the level of being a very watchable film, amidst some of the genre-required shenanigans that the Amicus heads felt were necessary to liven things up. You can check, check and triple check things like flickering candelabras, a dangerous woodsman, howling wolves, spooky old paintings, and a fog-shrouded cemetery, though the lack of symmetry on the plot side miraculously doesn't totally mangle the final project. Or maybe it's just my nostalgia talking, because there is a strangely calming effect that runs through this, and while maybe that's not the proper vibe for a horror title, the sense of knowing that this type of picture was on its way out�as a representative of the costumed Gothic horror genre�gets me a little misty-eyed for days gone by. English Gothic horror was a regular staple during my younger days, and seeing Peter Cushing's name in the credits always meant something good. A film like And Now The Screaming Starts! isn't the greatest example of period horror�and hardly Amicus' finest hour�but the participants (Baker and Cushing especially) are talented enough to give even a subpar story a surge of something different, whether it be complicated tracking shots or a commanding screen presence. Image Transfer Review: Dark Sky continues to treat older titles very, very well, and here this one is represented by a new 1.85:1 anamorphic widescreen transfer that according to liner notes was struck from 35mm vault materials. It's a massive upgrade to the speck-marred Image release from 2002, and though there are a few extremely minor bits of specking and some constant fine, the transfer here looks terrific. Colors are exceptionally bright, edge detail is good (if a bit soft), and the overall presentation, while not flawless, is impressive given its age. Audio Transfer Review: The audio track is presented in 2.0 mono, and it is serviceable without being anything more than basic. But that's not a bad thing, with voice quality here being quite clear, with just a bit of distortion during the occasional scream. Extras Review: Dark Sky has beefed up the extras, besting the Image release by including an additional commentary track, with director Roy Ward Baker, actress Stephanie Beacham, and film historian Marcus Hearn. It's a reunion of sorts for Baker and Beacham�their first time together since shooting this film�and despite a few dead spots the recollections seem as fresh as if this were shot last month. Baker laments what he refers to as the "ghastly title", and I file him under the sparsely populated category of "directors that give good commentary". The second commentary has been ported over from the Image release, and it features actor Ian Ogilvy and film historian Darren Gross. Repeat or not, it's a solid track all the way around, with Ogilvy uncorking with all manner of history, including a lot of discussion on the differences between Hammer and Amicus. Also included here are Amicus trailers (And Now The Screaming Starts!, Asylum, The Beast Must Die), a brief set of 18 production photos (down from the 55+ found on the Image release), biographies on Peter Cushing, Roy Ward Baker, Stephanie Beacham, Ian Ogilvy, Herbert Lom, Max Rosenberg and Milton Subotsky, as well a two-page insert booklet with production notes written by Christopher Gullo. The disc is cut into 12 chapters, with optional English subtitles. Dark Sky's new anamorphic transfer one ups the previous Image release, as does the inclusion of a second commentary track, this time featuring director Roy Ward Baker and actress Stephanie Beacham, making this well worth a double dip. Plus, it is pretty tough to not like an English horror film with Peter Cushing in it�even a sometimes slow-moving bit of Gothic costume piece like this one.